Great Britain is taking its largest ever team to the 2018 Winter Olympics, with 59 British athletes competing for the medals in Pyeongchang, South Korea, from February 9th to 25th. Top athletes from all over the world will be competing for a total of 102 medals at the 35,000-seater Pyeongchang Olympic Stadium and 13 other venues. 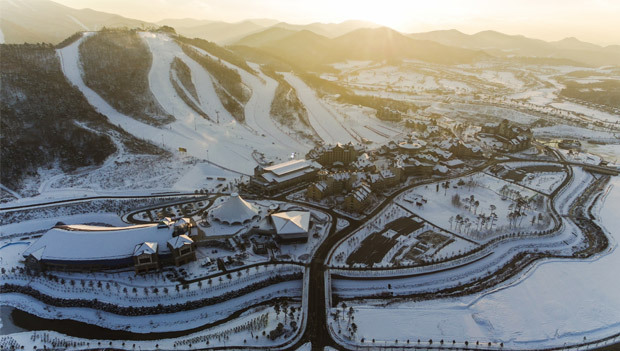 South Korea is promising a spectacular games, setting aside a budget of $2.4 billion to host the XXIII Olympic Winter Games – known as Pyeongchang 2018 – which will include four new events. The International Olympic Committee has added freestyle skiing, mass start speed skating, big air snowboarding and mixed doubles curling. The seven sports that make up the Winter Olympics are skiing, curling, skating, luge, ice hockey, biathlon and bobsleigh. Members of Team GB are hoping to improve on Britain’s biggest ever tally of four medals, achieved twice in the history of the games – in Chamonix in 1924 and in Sochi in 2014. Great Britain has traditionally enjoyed success in the skating rink, with the most famous victory being that of Jane Torvill and Christopher Dean and their figure skating triumph in 1984. They won a gold medal, with 12 perfect sixes and six 5.9s from the judges for their breath-taking routine to Ravel’s Boléro. Without further ado, let’s meet this year’s team! Short track speed skating world champion Elise Christie is a strong medal contender, who is expected to win at least five medals. The 27-year-old Livingston-born skater specialises in the 1,000 metre event and has been a European gold medallist ten times. At the Sochi Winter Olympics in 2014, Kent-born Lizzy Yarnold, aged 29, won gold in the women’s skeleton. She is hoping to repeat her success four years on. Veteran snowboarder Jenny Jones, 37, of Bristol, won snowboard bronze in 2014 and aims to emulate her success. The men’s and women’s curling teams, who won silver and bronze medals respectively in 2014, are hoping to better their tally in Pyeongchang. Figure skaters Penny Coomes and Nick Buckland, both aged 28, are going for gold in the ice dancing. They are five-times British National Champions and competed at the 2010 and 2014 Winter Olympics. Their 2017/18 season got off to a flying start when they won the gold medal at the 2017 CS Nebelhorn Trophy, setting a new personal best and qualifying for their Olympic spot in ice dance as a result. Other Team GB medal hopefuls include four Alpine skiers: Dave Ryding, aged 31, from Leyland in Lancashire, and 22-year-old Laurie Taylor from Basingstoke in Hampshire are aiming for gold in the men’s slalom, while 24-year-old Charlie Guest from Perth will be competing in the women’s slalom. The quartet is completed by women’s slalom and giant slalom competitor Alex Tilley, aged 24, from Torphins in Scotland. Team GB’s snowboarding team includes Southampton’s Billy Morgan, 28, Jamie Nicholls, 24, from Bradford and 20-year-old Rowan Coultas from Bedford. They are all aiming for gold in the men’s slopestyle event. Making its first appearance in 1998 in Nagano, Japan, snowboarding is a relatively new sport in the Winter Olympics. Fans in the UK who plan to cheer the team on will have to stay up all night to see some events, as South Korea is nine hours ahead of London. The games will be broadcast by the BBC and on some digital platforms. When you’re planning a meeting, always go for gold! &Meetings will give you a head start by organising the best venue. For some of the finest meeting rooms in London, please call 0800 073 0499.